Preserved moss, foliage and plants can enrich and liven any business, home or office space as well as offer the benefits of zero maintenance and lasting effects. Preserved creations are made using real, preserved reindeer moss, a lichen which requires no watering, no light, no trimming! The eco-friendly process to preserve the moss and foliage consists of replacing the water in the plant with glycerine. This process allows the lichen and foliage to maintain its natural texture as it reacts to the relative humidity in its environment. Harvested using ecological practices the moss is then dyed using natural food dies. Currently there are 18 different shades of moss available that can be used to create unique and customized designs, such as frames, wall tiles, and logos. There are also many types of preserved plants as well as natural pine cones and driftwood that can be integrated into your design. Talk to a design consultant at Off the Wall Greenscapes to start your creation of green wall art! Our customized estimates include delivery and installation. There are over a dozen colors to choose from when designing your preserved wall. Take a look at the creative ideas below for some examples! With the assistance of a design consultant at Off the Wall Greenscapes you can integrate the aesthetic benefits of real moss and plants into your indoor space without having to worry about lighting, watering or maintenance. Add a soothing background to a sign, logo or shelf. Create a simple, one toned back drop for a reception area or restaurant seating. Soften or lower a high warehouse ceiling or display your company logo! The possibilities are endless! Mix tones of greens together for a landscape or add them side-by side for contrast. Hang panels from a warehouse ceiling to create a more intimate space. Create multiple panels within custom frames as a hallway art wall. Display your company name or logo in moss or use moss as a soft, natural background. Create a piece of unique art. Insert shelving within the moss tiles or even a Wallflower frame! Custom frames can be added to your design. 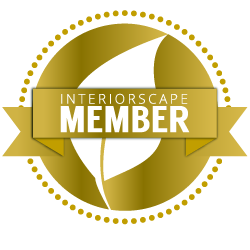 Off the Wall Greenscapes offers FREE consultations and estimates and would love to work with you to create a more interesting, healthier, greener environment for your business or residency.